Display progress lines at regular intervals. Display progress lines based on a specific status date. Display progress lines for specific dates you select. Display progress lines compared with the baseline plan or to the actual plan. Always display current progress line Select to always display a current progress line. At project status date Select to show the current progress line at the project status date. If no project status date has been set, the progress line shows at the current date. At current date Select to show the current progress line at the current date. Display progress lines at recurring intervals Select to display progress lines at recurring intervals that you select. You can choose daily, weekly, or monthly intervals. Daily Select to show progress lines at a daily interval. You can show progress lines every day, every work day, or at a regular interval, such as every third day. Then in the Daily section, click day or workday, and then click the frequency in the box to specify the frequency of progress lines. You can select a frequency from every day or every work day to every twelfth day or work day. Weekly Select to show progress lines at a weekly interval (which is the default). For example, you can show progress lines every other Tuesday. Then in the Weekly section, select the frequency in the week on box to specify the frequency of progress lines. You can select a frequency from every week to every twelfth week. 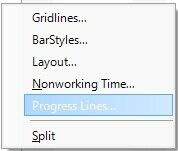 Select the check box to specify the day of the week on which you want to display progress lines. Monthly Select to show progress lines at a monthly interval. For example, you can show progress lines on the last day of every month. Then in the Monthly section that appears, specify your monthly progress line options. If you want to show progress lines on a particular day of the month, click Day, and then choose the specific day of that month. If you want to show progress lines on a relative day of the month, click The, and then select the date options from the boxes. The first date box specifies either the first or last day of the indicated month on which you want to show the lines. Begin at Select Project Start to specify that you want to show progress lines from the project start date. Select the option button next to the date box if you want to show progress lines beginning from another date you specify. 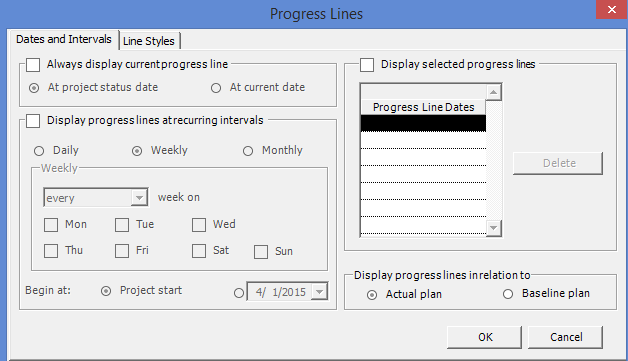 Display selected progress lines Select this check box and then enter dates in the Progress Line Dates list to specify dates on which to show progress lines. Progress Line Dates Enter the dates for which you want to show progress lines. Delete Click to remove a selected date from the Progress Line Dates list. Actual plan Click to display progress lines in relation to the actual plan. Baseline plan Click to display progress lines in relation to the baseline plan.